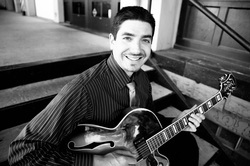 Olem received his Masters degree in Jazz Studies-Performance at the University of Oregon in 2013 where he received the prestigious Outstanding Graduate Performance Achievement Award in the area of Jazz Studies. "As a teacher my goal is to provide my students with the best possible learning environment I can. I aim to provide them with the knowledge they need to progress in their study of music. Particularly I want to create an avenue between teacher and student where I introduce information in an inspiring and insightful way that gets the student thinking critically and in turn the student gains knowledge and responds with thought and interaction relating to the topic." "I believe everyone has the ability to succeed. Music is an art form that speaks to people in many different ways. I do my best to tap into how each student learns and give them every opportunity to excel. I have a deep passion for the art form and I make every effort to connect with each student with the hopes of instilling in them a passion for music that will last a lifetime." Olem is also a guest clinician as various jazz festivals and events.